Those gathered at the Route 91 Harvest Festival in Las Vegas were doing what revellers always do. But the script would not let them persist in their pleasures, to let them be, communing together before their figures of country music. Thus began the merry go around about wording, explication, designation. The Nevada statute should have provided ample guidance to the authorities about what had transpired: ‘an act of terrorism means any act that involves the use or attempted use of sabotage, coercion or violence which is intended to cause great bodily harm or death to the general population.’ Down pat, precise, unquestionable. Las Vegas sheriff Joseph Lombardo preferred to demur from the statute. This is Trumpland, and relativised readings are permitted, adventurous plays in the world of the fake and real. For Lombardo, when pushed on the issue on whether this could be seen as an incident of terrorism, being a local counted. Paddock could not, ‘at this point’ be considered a terrorist; ‘we believe it is a local individual, he resides here locally.’ One can slaughter dozens and still not fall into the neat catchment area of the law on ‘terrorism’. President Donald Trump was in an even more problematic pickle. It was Trump who insisted that banning individuals from seven Muslim-majority countries was not merely sensible but necessary to protect the United States from ‘Islamic terrorists’. Such incidents of mass terror suggested that he might be looking at the wrong settings. Then came the remarks of Jennifer Williams in Vox claiming that the white surge inspired by Trump, those narky, indignant wonders of a certain demographic, had done more than their fair share of killing. Any history of such incidents is bound to be potted at best, but Williams sketches a few. March 2017 saw the death of Timothy Caughman at the hands of frenetic stabbing, for which the killer was charged with terrorism under New York law. In August, James Alex Fields, Jr. pushed the headlines by killing a woman and injuring some 19 others who participated in an anti-racist protest in Charlottesville. A few titbits from a grim harvest. Making America Great Again is not merely an enthusiastic project but a deflecting code. The code resists anything that might soil solid flag-bearing credentials, and rules out the initiated as potential terrorists. Killing and massacres are a terrible thing, but if done under the protection of the Second Amendment, it must surely lack the alien properties of foreign violence. One is killing behind the cloak of the law. If only the man from Mesquite had been a Muslim, then things would have been so much easier. It does, however, go deeper. The legal frame of reference is stunted in capturing domestic terrorism. Drafters are reluctant to net such figures. Randall Law’s Terrorism: A History (2009) suggests the need to consider terrorism more broadly. These might be state-directed. But the notion of the ‘American terrorist’ was more problematic, a tougher sell for the US citizen. Insanity is preferred by way of explanation. 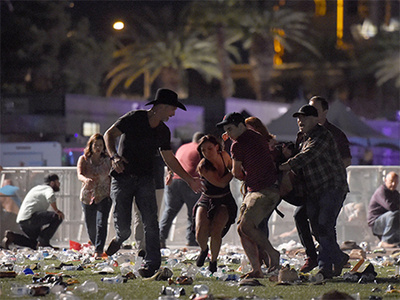 ‘The problem, of course, with the federal government, is there are multiple definitions of terrorism: from Homeland Security, FBI, governmental bodies that are in some sort of field overseas; the State Department has their own.’ But even in instances, as Nevada shows, where a statute is available, reluctance will froth and bubble. An act extraneous to the country, inspired by a foreign source, is another matter. Empathy is harder; judgement more easily skewed. Besides, goes this line of reasoning, there is little difference in the outcome. This, is then, what survivors and those facing charges are left with: a different appropriation, a side-stepping classification that doesn’t rile the patriots or the protectors of the law. And, for that matter, derail the project of MAGA.